Replacing window screens is our business, brand new, re-screened or repaired. We have 14 different models of swinging screen doors available in single or double door configurations. All models are available in optional colors and screen types. Pet doors and grills to help you extend the life of your patio sliders and give easy access in and out to your cat or dog. 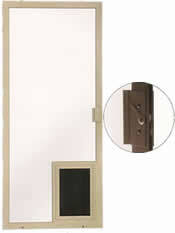 Rugged long lasting screen sliders with all metal locking handles.